There are two main types of stormwater drain (storm sewer) inlets; side inlets and grated inlets. Side inlets are located adjacent to the curb (kerb) and rely on the ability of the opening under the backstone or lintel to capture flow. They are usually depressed at the invert of the channel to improve capture capacity. Grated inlets have gratings or grids to prevent large objects and debris from falling into the sewer system. However, their bars are fairly widely spaced so that the flow of water is not impeded. Consequently, many small objects can fall through. Many of these small objects are caught by the catchbasin, or sump, which lies immediately below the grating. Water from the top of the catchbasin reservoir overflows into the sewer proper. The catchbasin serves much the same function as the "trap" in household wastewater plumbing in trapping objects. In the United States, unlike the plumbing trap, the catchbasin does not necessarily prevent sewer gases such ashydrogen sulfide and methane from escaping. However in the United Kingdom, where they are called gulley-pots, they are designed as true water-filled traps and do block the egress of gases and rodents. Most catchbasins will contain stagnant water during the drier parts of the year, and can be used by mosquitos for breeding. Larvicides or disruptive larval hormones, sometimes released from "mosquito biscuits", have been used to control mosquito breeding in catchbasins. Another method of mosquito control is to spread a thin layer of oil on the surface of stagnant water, interfering with the breathing tubes of mosquito larvae. The performance of catchbasins at removing sediment and other pollutants depends on the design of the catchbasin (for example, the size of the sump), and on routine maintenance to retain the storage available in the sump to capture sediment. Municipalities typically have large vacuum trucks that perform this task. Catchbasins act as a first-line pretreatment for other treatment practices, such as retention basins, by capturing large sediments and street litter from urban runoff before it enters the storm drainage pipes. Pipes can come in many different cross-sectional shapes (rectangular, square, bread-loaf-shaped, oval, inverted pear-shaped, and more commonly, circular). Drainage systems may have many different features including waterfalls, stairways, balconies and pits for catching rubbish, sometimes called Gross Pollutant Traps (GPTs). Several different materials can also be used, such as brick,concrete, or metal. Fiber reinforced plastic is starting to see widespread use for drain pipes and fittings. 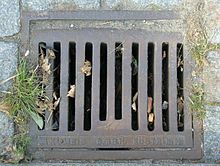 Most drains have a single large exit at their point of discharge (often covered by a grating) into a canal, river, lake, reservoir, sea orocean. Other than catchbasins, typically there are no treatment facilities in the piping system. Small storm drains may discharge into individual dry wells. Storm drains may be interconnected using slotted pipe, to make a larger dry well system. Storm drains may discharge into man-made excavations known as recharge basins or retention ponds. Water running off these impervious surfaces tends to pick up gasoline, motor oil, heavy metals, trash and other pollutants from roadways and parking lots, as well as fertilizers and pesticides from lawns. Roads and parking lots are major sources of nickel, copper, zinc, cadmium, lead and polycyclic aromatic hydrocarbons(PAHs), which are created as combustion byproducts of gasoline and other fossil fuels. Roof runoff contributes high levels of synthetic organic compounds andzinc (from galvanized gutters). Fertilizer use on residential lawns, parks and golf courses is a significant source of nitrates and phosphorus. Separation of undesired runoff can be done by installing devices within the storm sewer system. These devices are new to the market and can only be installed with new development or during major upgrades. They are referred to as oil-grit separators (OGS) or oil-sediment separators (OSS). They consist of a specializedmanhole chamber, and use the water flow and/or gravity to separate oil and grit. Runoff into storm sewers can be minimized by including sustainable urban drainage systems (UK term) or low impact development practices (US term) into municipal plans. To reduce stormwater from rooftops, flows from eaves troughs (rain gutters and downspouts) may be infiltrated into adjacent soil, rather than discharged into the storm sewer system. Storm water runoff from paved surfaces can be directed to unlined ditches (sometimes called swales or bioswales) before flowing into the storm sewers, again to allow the runoff to soak into the ground. Permeable paving materials can be used in building sidewalks, drivewaysand in some cases, parking lots, to infiltrate a portion of the stormwater volume. In many areas detention tanks are required to be installed inside a property and are used to temporarily hold rainwater runoff during heavy rains and restrict the outlet flow to the public sewer. This lessens the risk of the public sewer being overburdened during a heavy rain. An overflow outlet may also be utilized which connects higher on the outlet side of the detention tank. This overflow would prevent the detention tank from completely filling up. By restricting the flow of water in this way and temporarily holding the water in a detention tank public sewers are far less likely to become surcharged.